Serves 4 people. Can adjust flavouring/veg according to your taste – no need to follow exact measurements! Saute onion in a little bit of oil until it turns brown and then add the carrots and baby corn and saute for 5-8 minutes. Add the mangetout/sugar snap peas , stir in the soy sauce, honey, onion soup mix, salt and pepper and cook for a couple more minutes. Take off the flame. In a bowl mix the chicken strips with the soy sauce, honey, peanut butter, garlic powder and salt and pepper. In a griddle pan heat 1-2 tbsp oil and cook the chicken strips on a medium to high light. Griddle on each side until cooked through (check it’s cooked by cutting a couple of the pieces and making sure the inside of the chicken is white). 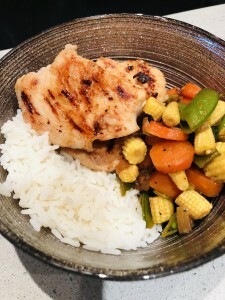 Serve the chicken and veg with rice – Uncle Ben’s boil in the bag rice is easiest as it cooks to perfection in ten minutes.